24 GRAMS OF PROTEIN PER SCOOP: WheyXX helps you reach your daily protein requirements without adding a ton of calories and carbohydrates to your diet. PUT YOUR BODY IN THE ZONE FOR MUSCLE BUILDING AND RECOVERY: WheyXX has a positive nitrogen balance to create the optimal state for muscle growth. 3 EASY WAYS TO ENJOY: You can get your daily protein no matter where you are. Stir, shake, or blend WheyXX – the choice is yours. 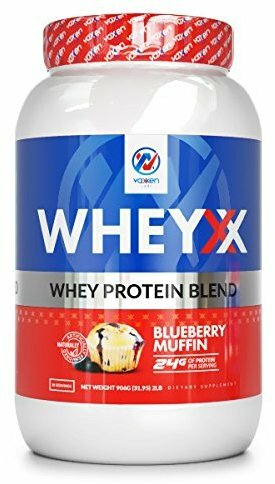 UNIQUE FLAVORS: Once you try mouthwatering Birthday Cake or Blueberry Muffin, you'll never go back to your old protein powder.